All of the wood (mostly teak, mahogany or rosewood) used to make the Asian furniture we carry is either solid re-claimed wood or solid wood harvested from certified plantation grown trees. The result is beautiful Asian furniture pieces that don't leave an ugly scar on the earth. We also do not use particle board, paper board, veneer or any other low quality substitute. If an item says "mahogany" then it is made entirely of mahogany and is not just stained "mahogany color". -Reclaimed wood comes from sources such as old houses, bridges and railroads that are torn down and sold in scraps. The wood is then treated and re-finished, and reborn as furniture. Reclaimed wood not only saves trees and utilizes waste but is actually stronger than new wood because aging naturally decreases water content in wood. The result is wood that is far less likely to warp, expand or contract making it a more durable and environmentally friendly choice. Over harvesting of forests is big problem all over the world despite the efforts of green organizations world wide. It is the responsibility of consumers to ensure that the Asian furniture that they purchase is made of environmentally sustainable materials such as reclaimed wood. -We use Plantation grown teak to make some of our furniture pieces which comes from plantations that are regulated by the Indonesian government vs. harvested from virgin forests. These plantations continually plant new trees and are not permitted to expand into new regions. Plantation owners instead strive to maximize wood out put from their land by improving farming methods. The result is high quality lumber without the continued destruction of earths remaining forests. The majority of our furniture is made with mortise and tenon joinery and without the use of nails. Have you ever purchased a piece of furniture that begins to loosen and wobble after a just few years? Take a look and you will most likely find it was fastened with nails. Through use nails begin to pull from boards and quickly become looser and looser, and are difficult to repair. Screws on the other hand, when fastened securely into sturdy wood, will stay in place far longer and can be re tightened if needed. -Mortise and tenon joinery are among the strongest joints in furniture making. There are two basic parts, the mortise, which is a recessed cut, and the tenon, which is basically a corresponding sized peg which is a solid extension of a board. Fit them together and fasten with a screw or an additional peg and you've just made furniture that will last for generations. 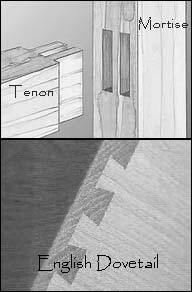 -English dovetail drawers are not only sturdiest construction technique but allow for more storage than commonly used french dovetail drawers English dovetail drawers are a form of tenon joinery recognizable by interlocking triangle pattern shown to the right. Most cheaper furniture will use French dovetail construction which is not as solid or space efficient. For details about the construction of an individual piece found on our site please contact our staff at 866-878-3325. Warning! Just Because The Labels Says So Does Not Mean It Is! Unlike the food and clothing industry, the furniture industry does not have regulations over labels and advertisements. Furniture labeled as "Brown Oak" may only have a "Brown Oak" colored stain and actually be made of veneer and particle board vs. real Oak. Another tricky labeling tactic commonly used is "solid wood construction" which implies that the furniture is made of solid wood. Instead what that really means is that the furniture is "solidly constructed" of "wood", which may mean particle board. To ensure you get what you pay for, It is important to find out what a piece of furniture is truly constructed of before you make a purchase. Learn more by clicking on the NBC News Logo below.